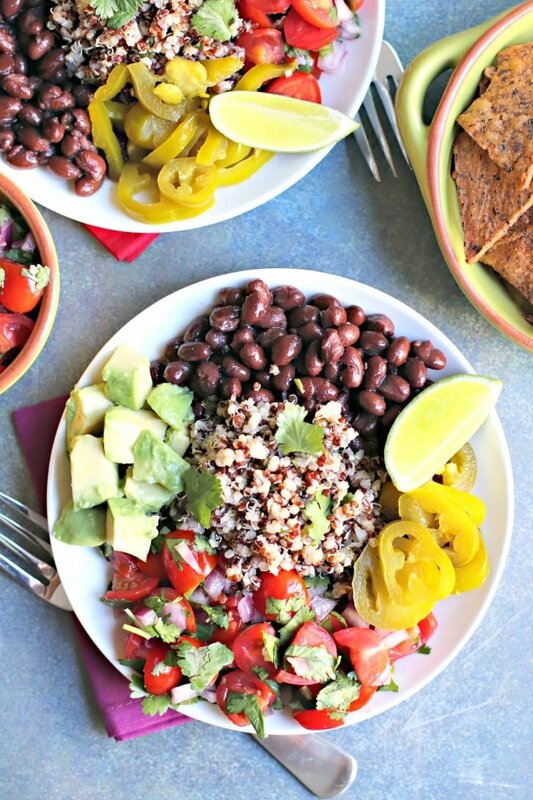 Do you like to make burrito bowls at home? My go-to formula is to pick a bean and a grain, then add toppings. I used to choose rice for my bowls, until I tried using Cilantro Lime Quinoa. Quinoa is a great alternative since this gluten-free seed is high in protein, fiber, and many vitamins and minerals including iron. And now Quinoa Burrito Bowls are my favorite! The inspiration for Quinoa Burrito Bowls came from one of my favorite meals at Veggie Grill. I love Veggie Grill‘s Sonoran Bowl that’s made with quinoa and black beans. It’s also topped with roasted carrots, salsa, avocado, jalapenos, and roasted red pepper sauce. I decided to use avocado and pickled jalapeno and add cherry tomato pico de gallo for my version. This pico del gallo is my favorite because you can make it in minutes, and it’s fresh and flavorful. It’s my go-to condiment when I make Roasted Sweet Potato Tacos. And I think you’ll enjoy the combination of tastes and textures in this bowl. 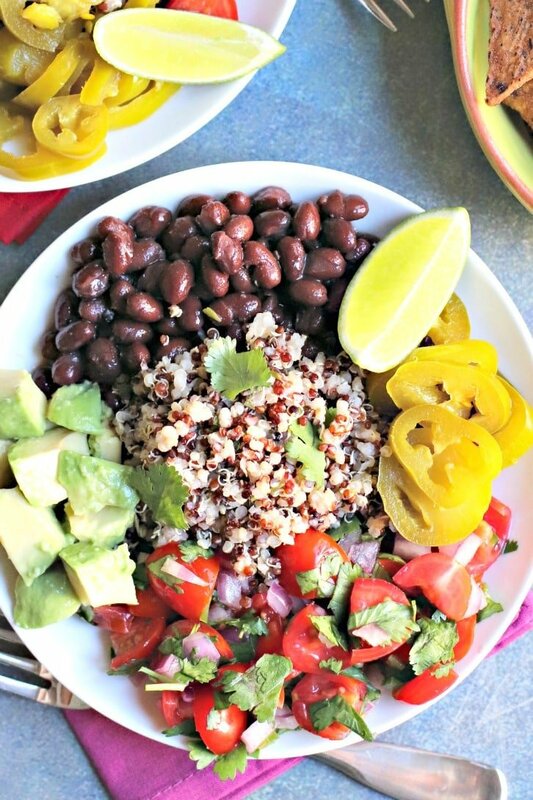 The components of Quinoa Burrito Bowls can be made in advance. Sometimes I like to do some batch cooking meal prep on the weekends. Then I can throw meals together in no time during the week. If you want to do this, you can make the Cilantro Lime Quinoa and the black beans ahead of time. In fact, you can even eat them cold in this bowl if you don’t feel like reheating them. But all the elements are quick to make, so these bowls come together in about 30 minutes, making them a great weeknight dinner option. I make the quinoa in my Instant Pot, but you can make it on the stove if you don’t have a pressure cooker. And for the beans in this Quinoa Burrito Bowl, I use a can of black beans with the liquid (also known as aquafaba) along with a little cumin, dried oregano, and salt for flavor. In addition, the cherry tomato pico de gallo can be prepped ahead of time. Simply combine sliced tomatoes, diced red onion, minced jalapeno, chopped cilantro, lime juice, and salt. You may even want to make a double batch to use with other dishes or for snacks during the week. Building your Quinoa Burrito Bowls is really easy. Start by placing some Cilantro Lime Quinoa in the middle of each bowl. Then surround it with the black beans, pickled jalapenos, pico de gallo, and diced avocado. Serve each bowl with a lime wedge and it’s time to eat! 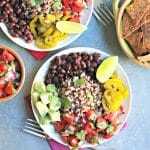 This recipe makes four Quinoa Burrito Bowls, but if you’re serving fewer people, the leftovers will last for several days refrigerated. It’s perfect for quick healthy dinners and lunches on the go. Now let’s make Quinoa Burrito Bowls! 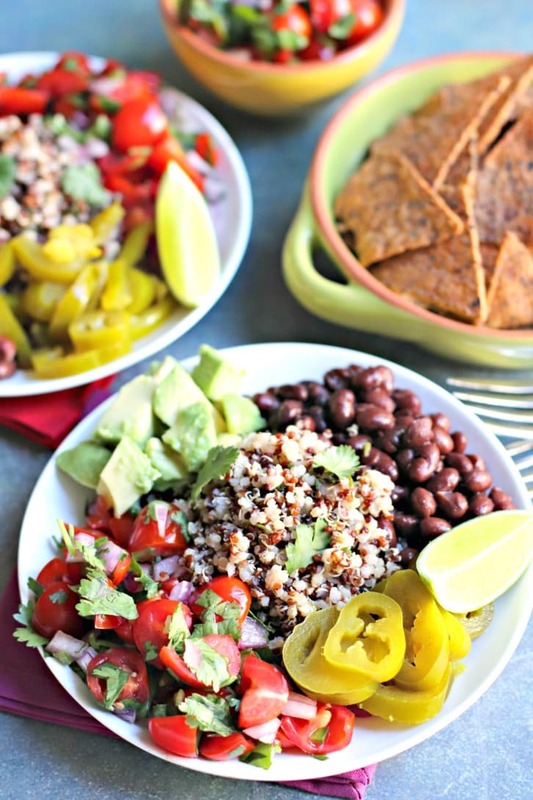 Quinoa Burrito Bowls are easy to assemble and delicious to eat. 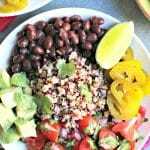 Cilantro lime quinoa, seasoned black beans, cherry tomato pico de gallo, pickled jalapenos, and diced avocado come together in a meal that's vegan, gluten-free, and oil-free. 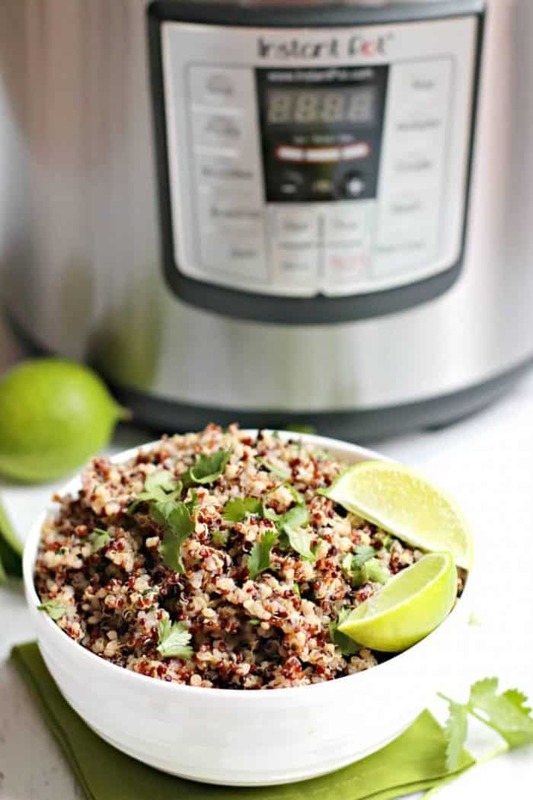 Prepare the Cilantro Lime Quinoa and keep warm. In a small sauce pan, combine the black beans and their liquid with the cumin and oregano over medium heat. Stir occasionally until the beans are hot. Taste and add salt, if desired. Combine the ingredients for the cherry tomato pico de gallo in a bowl and toss well. To assemble the burrito bowls, divide the Cilantro Lime Quinoa among four bowls. Add a quarter of the black beans to each. Top with cherry tomato pico de gallo, sliced picked jalapenos, and avocado. Enjoy! All of the elements of these bowls can be made ahead of time and assembled when ready to eat. You can either reheat the quinoa and beans, or enjoy them at room temperature. I like to make the components over the weekend so I can enjoy Quinoa Burrito Bowls for lunch during the week.